It's time for a tutorial: make some simple but stylish felt lavender sachets decorated with butterflies. Lavender sachets are one of those things that used to feel super old fashioned but have started to be popular again - not least because the pesky clothes moth is on the rise! (Boooooo). 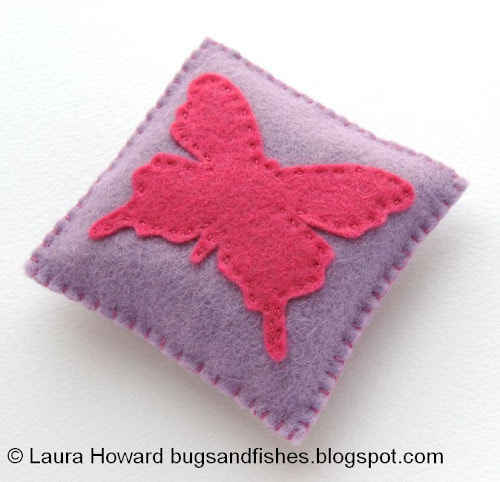 They make lovely little gifts and if you're just learning to sew, making these is a great way to practise running stitch and blanket stitch. 1. 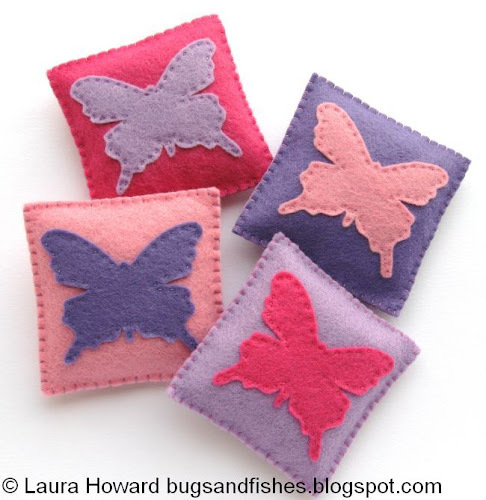 For each sachet, cut out two felt squares and one butterfly shape in a contrasting colour. 2. 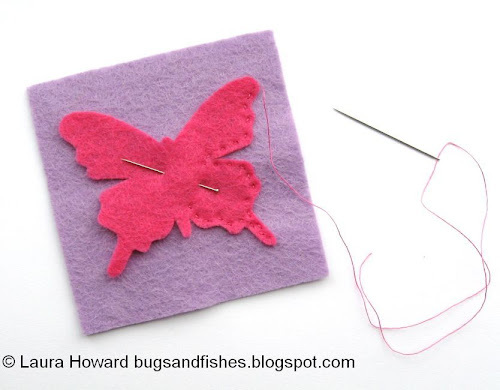 Pin the butterfly in the centre of one of the squares, and sew it in place with small running stitches in matching sewing thread. 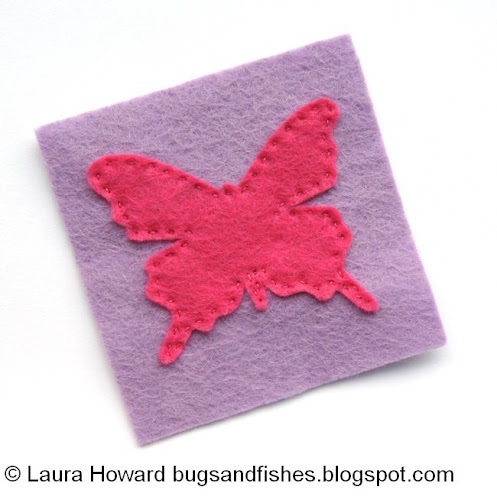 Your butterfly will now look something like this. 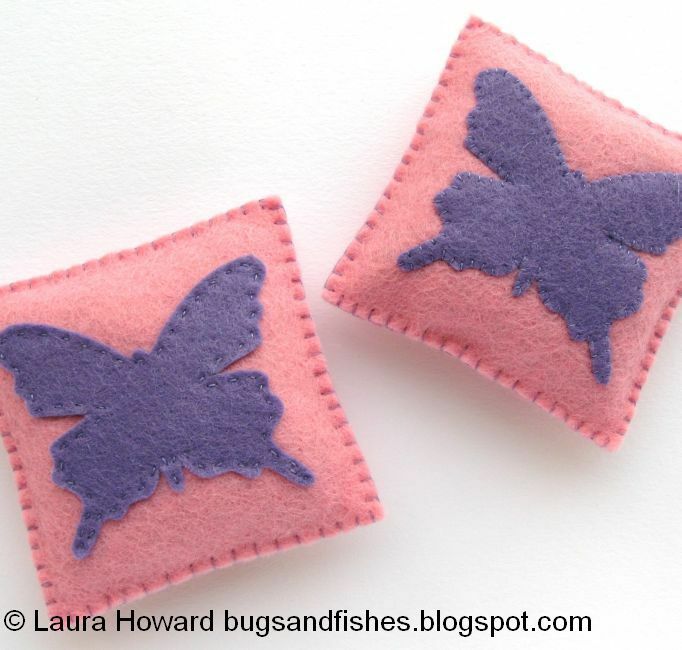 If you want you could add the butterfly body shape included on the template or decorate the butterfly like these butterfly brooches, with sequins or embroidery, but for these sachets I'm keeping things simple. 3. 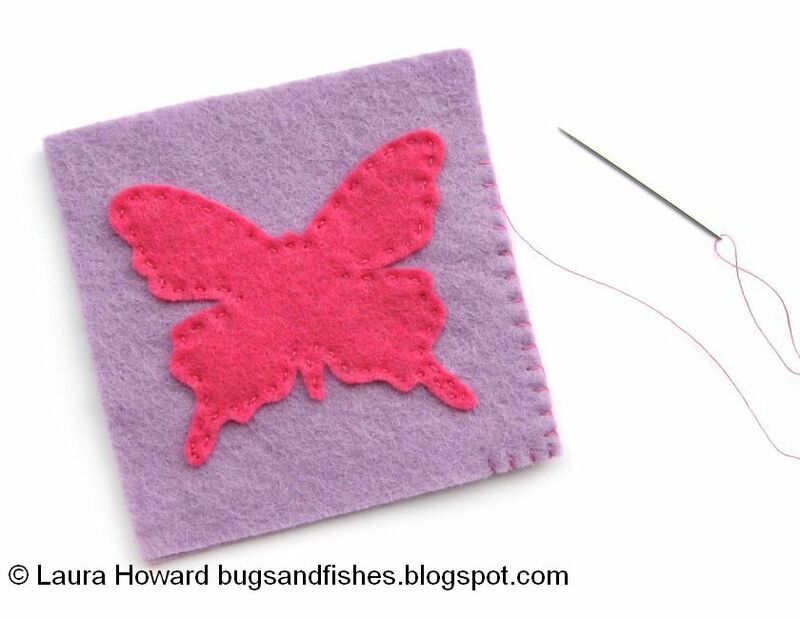 Place or pin the two squares together and sew around the edge with blanket stitch - make sure your stitches are quite close together so there won't be holes for the lavender to escape from, and leave a gap for stuffing the sachet in the next step. I used the same thread as before, so the stitching stands out as an extra decorative feature. If you prefer you could use matching sewing thread so your stitches will blend in with the felt. 4. 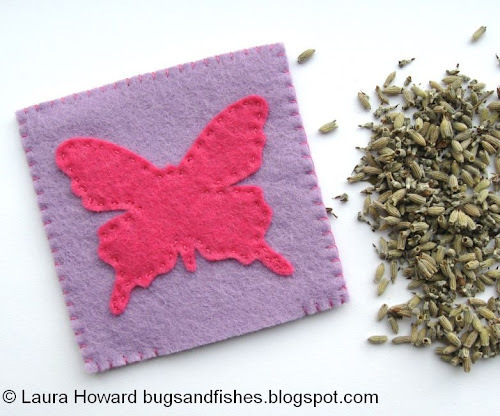 Fill the sachet with dried lavender. I use a small teaspoon for this (I have one that I keep in my craft stash so it only ever gets used for crafty things), spooning the lavender from a small tub or tray like an empty margarine tub. 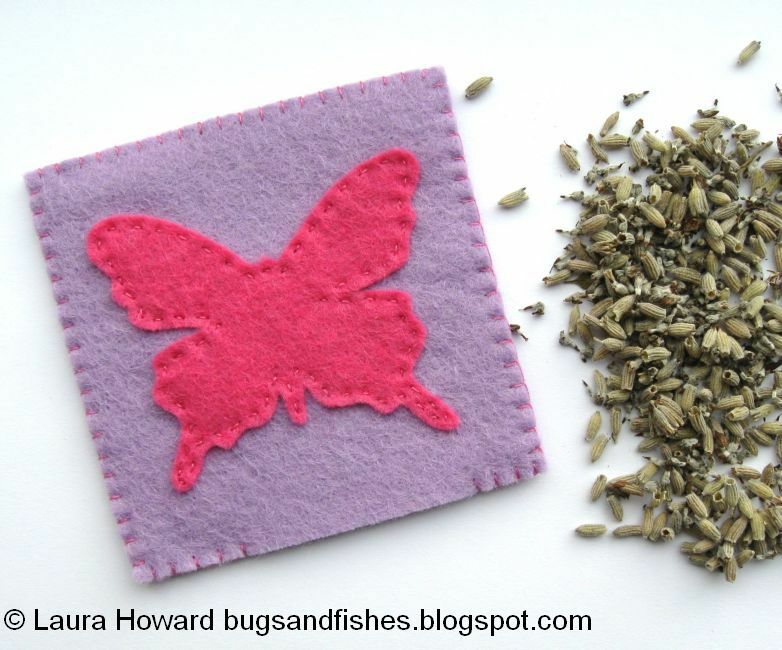 Use the handle end of your spoon to gently poke the lavender into the corners, and don't overfill the sachet. If you prefer, you could use whip stitch to sew your butterfly in place - like the butterfly on the right in this photo - but I like how the butterfly shape stands out more from the backing felt when you use running stitch. 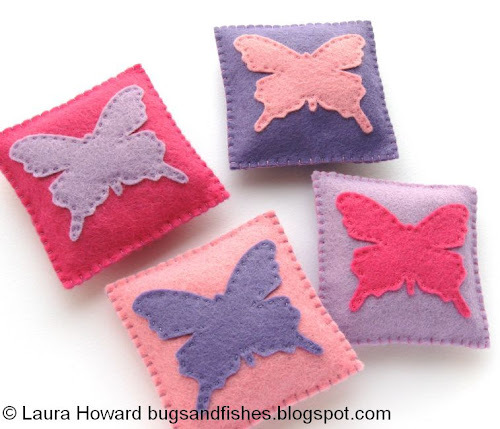 These are so quick and fun to sew, you can make a whole batch in no time. 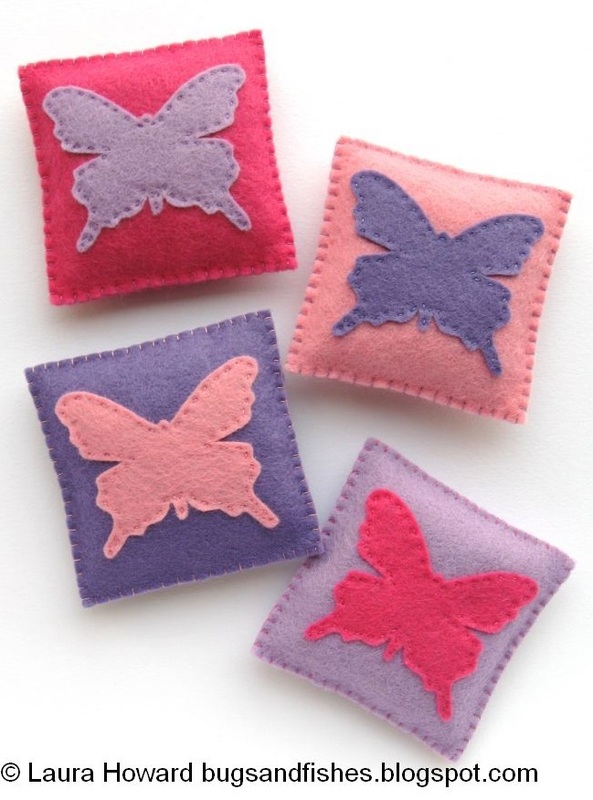 Matching pairs of sachets (like the reverse-coloured pairs I've sewn) would make a lovely gift, tied together with pretty ribbon. 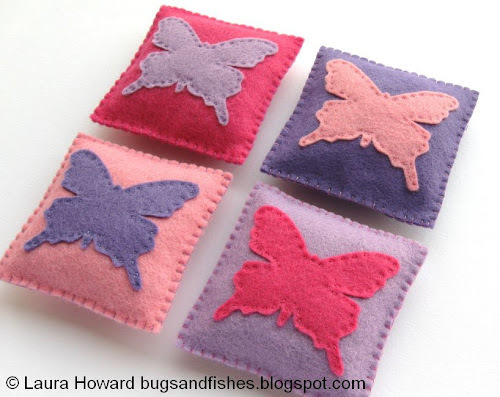 This tutorial is for non commercial use only: you can use it to make as many lavender sachets as you want for yourself or as gifts, but please don't make any for sale. You may borrow a couple of photos if you want to blog about this project, but remember to credit me and link back to this page on my blog, and do not reproduce my entire tutorial / share my templates on your site. Thanks! Söta små kuddar! Som både pryder och luktar gott!